Peter Dickinson is one of the most celebrated and productive living English composers. Besides his musical compositions – recorded on a baker's dozen CDs – he has written extensively about English, American and French music, including books and shorter pieces about Lennox Berkeley, Copland, Barber, Cage, Lord Berners. He has also written about poets. He was a critic on the BBC and Professor at more than one university, following a career as organist, and graduate study at Juilliard from 1958 to 1961. He is now going strong in his eighties. I have reviewed many of his recordings and some of his books on this site. I wish to acknowledge that he has encouraged me in my own work. The present book is mostly a collection of his shorter publications over a period of many years. Some of these clarify – with specifics – what he was doing in many of his musical works; I wish I had had access to them when I was writing about his music. Some are expressly autobiographical, and others implicitly so. He includes accounts of collaborations with his sister, Meriel, an accomplished mezzo, and an account of her individual career. The collection is divided into eight general sections. 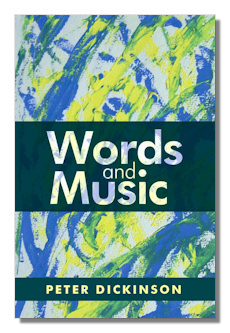 The longest of these, "Writings about Music," includes discussions of Ives, Cage, Satie, Thomson, a survey of American concertos, and a version of his essay on "style modulation as a compositional technique." His own practice of combining different styles in the same work comes later. African American influences on British music – chiefly jazz – are featured in another article. Dickinson has long been interested in poetry, poets, and setting poems to music. In the case of Philip Larkin, for whom he wrote a memorial piece, he explains why that poet's poems are simply spoken, not sung. His favorite poets also include Auden. And he has written about connections between other poets and musicians: Emily Dickinson; Gertrude Stein and Thomson; T.S. Eliot and Stravinsky, Britten, and Rawsthorne. There is much more, including accounts of his meetings with Auden, Larkin and David Munrow, an interview with James Jolly of Gramophone, and some memories of a few others. Reading this book I found to be a delight and it will be of interest to anyone who cares about the lives, music or poetry of those he writes about. By the way, typically for this publisher, this is a handsomely put together volume, its heavy-stock but flexible white paper worthy of a fine art book.